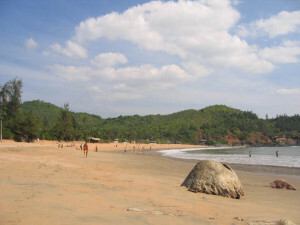 Om beach is one of the five beaches of Gokarna. Gokarna is a small temple town in Uttar Kannad district of Karnataka. It is one of the spiritual centers in South India. Many of the pilgrims visit the place for worshipping the Lord Shiva known here as Mahabaleswar. The place is a great pilgrimage center and attracts many tourists every year. This small town offers many of the natural sightseeing and spectacular beaches to the tourists. One can visit the Om beach located in this town. This beach is in the shape of the Hindu auspicious symbol “OM”. The beach is also regarded as a holy place. It is believed that taking bath in the sea in the Om beach removes much of the sin from one’s life. Most of the tourists visit this place for worshipping Lord Shiva. The shape of the beach itself is so auspicious that the pilgrims get greater satisfaction in bathing on this beach. Apart from being a spiritual center, it is a great place for enjoying natural sightseeing. Though the place is small and is away from all kind of development, one can enjoy the natural surroundings near the beach. The beach is a serene place to sit and watch the nature. During festivals it gets surrounded by many devotees. The serene beach offers great peace to its visitors. Majorly the devotees frequent this place. Swimming can be greatly enjoyed by the tourists here in the Om beach. It is safe to swim here. Even devotees take a dip as a part of the spiritual ritual. Though much of the engaging activities are not available here on this beach, one can enjoy the scenic beauty of this beach. Children love to play on this beach. The rocky and hilly surrounding offers a picturesque background to the beach. The sunset under this backdrop is one of the amazing experiences that the tourists have on this beach. Many a time boats are also available on this beach. One can get on the boat to take a small visit to the sea. One can visit the temples located near the beach. One can visit the Mahabaleswar temple, Maha Ganapati temple and Uma Maheswar temple. The Mahabaleswar temple and Maha Ganapati temple are located on the beach and relates to the mythological character Ravan. The Maha Ganapati temple is meant for worshipping Bal Ganapati who deceived Ravan and then the Mahabaleswar temple refers itself to the biggest and strongest lingam which Ravan could not lift from earth’s surface. Accommodation is not a problem here. One can get budget hotels near Gokarna. It can be reached by air, rail and road. The nearest airport is Goa. It is only 90km from Goa. One can catch cabs from Goa to reach Gokarna. The Gokarna station is located at the distance of 8km from the town. Big cities like Mangalore and Karwar connect to Gokarna through railways. Road routes are also available to Gokarna from Mangalore and Bangalore. One can easily reach to the beach through road routes as well.